At New York Now, booth 2959, Kalaty will feature the company’s 14 rug collections from the K-Two series of fashion-forward popularly priced area rugs that range in style from contemporary to transitional to traditional and in a variety of yarns, weaves and constructions. Also at New York Now, Kalaty will feature the company’s three high-fashion hand-knotted accent pillows collections, which are inspired by a number of the company’s finest heirloom-quality rug collections: Pillows Bespoke, Pillows Eclectic and Pillows Soumak. Pillows Bespoke: Hand knotted using Kalaty’s finest premium yarns; features contemporary abstract, transitional and traditional motifs and colors found in some of the company’s best-selling heirloom-quality rugs. Pillows Eclectic: Similar in quality to Bespoke pillows; also features contemporary, transitional and traditional motifs, patterns and colors inspired by best-selling high-end hand-knotted Kalaty rugs. Pillows Soumak: Hand knotted using premium wool in a flat Soumak weave with the unique herringbone texture inherent in the soumak weave; features rustic tribal and Southwestern motifs, as well as traditional and transitional motifs found in Kalaty’s popular Soumak rug collection. All Kalaty pillows are available in two sizes: 22” x 22” and 14” x 22”. The Kalaty family Oriental rug business originated more than 100 years ago in Iran under Mirza Kalaty’s grandfather, and in 1979, Mirza Kalaty established the company in the USA. Mirza Kalaty and his five sons – Ramin, Mike, Farshad, Ariel and Kamran – today run the company. Kalaty Rug Corporation recently expanded with a new generation having proudly entered the family business, which continues to progress through design, innovative coloring and finishing, as well as through its commitment to provide customers with heirloom-quality area rugs and unparalleled service. Kalaty constantly maintains a vast inventory of collections, sizes and shapes and takes pride in offering same-day shipping on most products. Kalaty showrooms include New York (295 Fifth Ave), Atlanta (AmericasMart, 4-G14), Las Vegas (World Market Center, B-455) and High Point (IHFC G369). 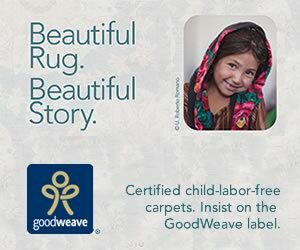 Published verbatim courtesy of Kalaty Rug Corporation.